Jessica and Samantha are back again to help you wade through the ocean of gear to help you find the best, most reliable, safest and most convenient gear to make your life as a new mom as easy as possible. Now that you’ve survived baby gear with Lady and the Blog’s A New Mom’s Ultimate Baby Gear Guide Part I, Part II, Part III, Part IV and Part V, it’s time to tackle the must-have toddler gear to make your life as a mom of an active toddler as easy and fun as possible. Yesterday we brought you the New Mom’s Ultimate Toddler Gear Guide, Part I: Eat, Sleep & Play, now it’s time to hit the road and tackle the must-have toddler gear to make your strolling and traveling a snap. Made for the mom or dad on-the-go, toddlers can join in on the exercise in style with the Joovy Zoom 360. Featuring a quick fold design, aluminum frame with shock absorbing suspension, extra wide reclining seat, and oversized sun canopy, this jogger stroller for the athletic parent offers many features typically not found in its category. Safety standards are impeccably in place with a 5 point harness system, and reflective packaging on all sides for the highest visibility during nighttime use. The Joovy Zoom 360 retails for $269.99. Why We Love It: This smooth rider is the largest jogger stroller currently available, withstanding the ability to support a child up to 75 lbs in weight. In it for the long mile, the Joovy Zoom 360 grows with you and your child. 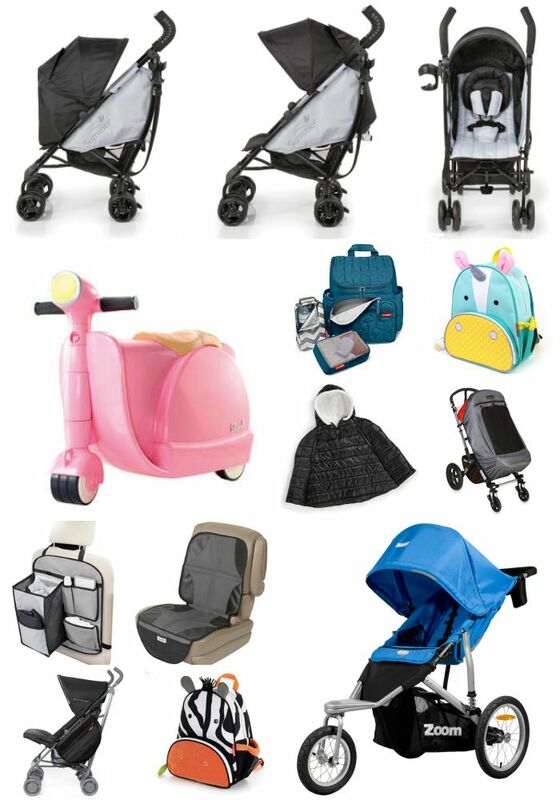 Visit Joovy online to pick the perfect jogging stroller to get you moving with your little one or visit them online online on Twitter, Facebook or Pinterest. The umbrella stroller that has it all, the Summer Infant 3Dflip was built for the curious toddler at heart. Featuring a reversible design unlike any other umbrella stroller, the 3Dflip allows for baby to face you or the world. The smooth glide and anti-lock front brakes make this lightweight aluminum frame stroller an enjoyable vessel for the road ahead. The Summer Infant 3Dflip retails for $129.99. Why We Love It: Complete with perks that include a parent cup holder and side storage pocket, there’s no need to spring beyond this very accessible price point for add-on accessories. Visit Summer Infant online to pick up the amazingly versatile stroller or visit them online on Twitter, Facebook, Instagram or Pinterest. A great diaper bag is one of the most important tools in a mom’s arsenal and the baby gear geniuses at Skip Hop demonstrate once again why they are leaders in the baby and toddler gear world with their fantastic Saddlebag design. Everyone knows the frustration of umbrella strollers and diaper bags; the second your little one is out of the stroller the weight of the diaper bag tips the entire stroller over. However, the Skip Hop Saddlebag design solves this issue by balancing the weight of the diaper bag along the length of your stroller for hassle-free strolling. Featuring velcro straps that make it easy to attach and remove, the Saddlebag is the perfect diaper bag to pair with your umbrella stroller for a tip-free strolling experience. As if that wasn’t fantastic enough, the Saddlebag features an insulated interior so the bag can double as a cooler for extra versatility. The Skip Hop Saddle Bag retails for $25.00. Why We Love It: This diaper bag seamlessly solves the frustrating umbrella stroller tip over crisis and doubles as a cooler to boot making it a versatile, functional and absolutely indispensable for anyone with an umbrella stroller or anyone who needs a little extra diaper bag storage on their stroller without sacrificing valuable stroller basket space. Visit Skip Hop online to pick up this must have umbrella stroller accessory or visit them online on Twitter, Facebook, Instagram or Pinterest. In the city my stroller functions as my car so anything that helps my son to be more comfortable in his stroller is a key weapon in our toddler gear arsenal so we were so excited to discover the Prince Lionheart Deluxe SnoozeShade. This Deluxe sunshade does it all: it protects agains 97.5% of the sun’s UV rays (the equivalent of UPF 40+), wind, mosquitos, chilly breeze and even light rain and most importantly provides a shaded environment to help facilitate naptime on the go. The Prince Lionheart Deluxe SnoozeShade works on any single wide stroller and retails for $60.00. Why We Love It: This sunshade is a lifesaver while out and about. Small to pack and so easy to pop onto any of my strollers it gives my little guy the right amount of shade and seclusion to take a great nap whether we are running errands around the city or relaxing on a sunny day at the beach. Visit Prince Lionheart online to get this stroller nap time essential to keep your little one shaded and snoozing while on the go or visit them online on Twitter, Facebook, Instagram or Pinterest. Wintertime is just around the corner, which means so is the daily struggle between independent toddlers and their winter coats. The Summer Infant Car Seat Coat Sherpa Puffer is a stylish coat that suits children from 8 months to 3 years of age, and is the perfect stylish and waterproof solution for the wiggly toddler. The Summer Infant Car Seat Coat Sherpa Puffer retails for $29.99. Why We Love It: So much more than an object of convenience, the Summer Infant Car Seat Coat Sherpa Puffer is actually a crucial product for a child’s safety. With so many parents unaware that a bulky jacket beneath a car seat harness is actually dangerous, this coat’s innovative design eliminates the hazard and the hassle. Visit Summer Infant online to pick up the smart little coat that makes winter car travel warm and safe or visit them online on Twitter, Facebook, Instagram or Pinterest. 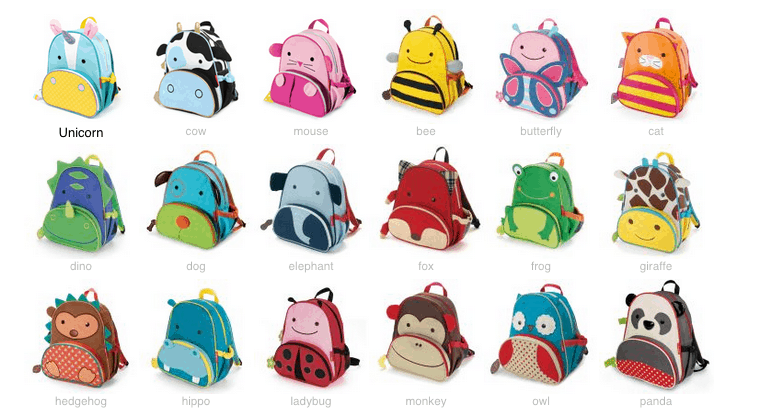 Anywhere a toddler goes, lot of stuff is sure to follow so keep your little one’s stuff contained in these adorable Skip Hop Zoo Packs toddler backpacks. Made from durable material and featuring 21 adorable animal designs (a selection pictured above), these Zoo Packs are perfectly sized for your preschooler at school or at play. The Zoo Pack designs all include a mesh side pocket designed to fit a juice box, sippy cup or water bottle and a front pouch perfect for snacks or other necessities. The Skip Hop Zoo Packs retail for $20.00. Why We Love It: The Zoo Packs are a perfect size for toddlers on-the-go and the adorable animal designs are sure to be a big hit with toddlers who will love the independence of picking out their favorite animal to bring home. Adorable to look at and made with toddlers and preschoolers in mind this is a great addition to your back-to-school list. Visit Skip Hop online to pick the adorable Zoo Lunchies animal that your little one will love or visit them online on Twitter, Facebook, Instagram or Pinterest. One of the most challenging things about traveling with a toddler is making sure you have all the important snacks, toys and diaper gear you will need when out and about while balancing a bulky diaper bag and chasing after a toddler. Enter the Skip Hop Forma Backpack Diaper Bag to solve all of you diaper bag needs. The Forma Diaper Bag has a stylish quilted fabric design and the extra wide opening means that it’s a snap to find everything in your diaper bag at a glance. Add to that insulated side pockets and a front compartment with two multi purpose packing cubes and an internal changing pad pocket that serves double duty as a laptop pocket and you have the perfect diaper bag for day to day and especially for travel. Best of all, the backpack design allows for hand-free transport of all your toddler essentials while your hands stay free to chase your toddler. The Skip Hop Forma Backpack Diaper Bag comes in black and peacock and retails for $70.00. Why We Love It: The ultimate intersection of functional and fashionable the Forma Diaper Bag is a stylish accessory that is actually a perfectly designed diaper bag with plenty of room for any and everything you will need when out on the go — what’s not to love? Visit Skip Hop online to pick up the must-have diaper bag for travel or long days out away from home or visit them online on Twitter, Facebook, Instagram or Pinterest. Perhaps the most adorable and handy thing to happen to traveling with children, the Diggin’ Active Skootcase brings undeniable fun to luggage. Made to look like an old school Vespa, the Skootcase comes in a variety of colors, and is ready to be filled with the little ones clothes and toys for the journey ahead. Kids can scoot along atop their suitcase at home or at the airport. The Diggin’ Active Skootcase retails for $69.99. Why We Love It: The Skootcase is built sturdy so that items packed inside are secure, and the carrying strap makes it easy for parents to wear on the shoulder, should its driver get tuckered out. Best of all, the Skootcase is an ideal size for traveling, and fits perfectly in the overhead bin as carryon-on luggage. Visit Diggin’ Active Skootcase to pick our an adorable toddler suitcase that is as cute as it is functional. The Summer Infant Tidy Travels Organizer is a must-have for trips near or far in the car. An organizer that has it all, it attaches the back of the front seat, serving as a caddy for diapers, changing mats, wipes, lotion, and more. The Summer Infant Tidy Travels Organizer retails for $19.99. Why We Love It: The included change pad keeps your car interior clean from accidents during changes, and stores easily in front of a “pop out” trash bin. This receptacle conveniently fits ordinary plastic grocery bags as a liner and stores flat while not in use. Visit Summer Infant online to pick up the must have piece of gear to keep your car perfectly organized or visit them online on Twitter, Facebook, Instagram or Pinterest. Need more toddler gear guidance? Check out A New Mom’s Ultimate Toddler Gear Guide, Part I: Eat, Sleep & Play. Want to know more about the best baby gear for a new mom? Check out A New Mom’s Ultimate Baby Gear Guide, Part I: Eat, Drink, Stroll & Play, A New Mom’s Ultimate Baby Gear Guide, Part II: Nursery, Swings, Sleep & More andA New Mom’s Ultimate Baby Gear Guide, Part III: Fashion Essentials for the New Mom, A New Mom’s Ultimate Baby Gear Guide, Part IV: Day-to-Day Traveling with Baby and A New Mom’s Ultimate Baby Gear Guide, Part V: Planes, Trains & Automobiles.